Under the current social and political climate, in which the rise of ever more global nationalism and political backwardness is strengthened daily, we as artists, curators, activists and people need literal and metaphorical bridges to stand united and to take action together. 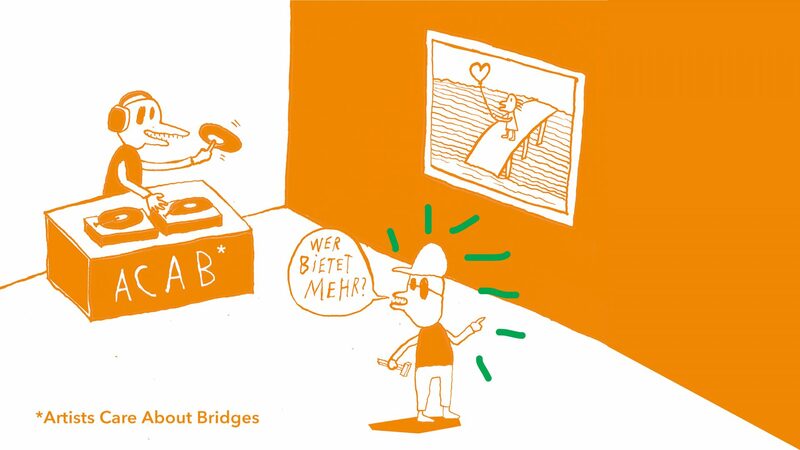 In the spirit of the necessity of building bridges and not borders, Artist Care About Bridges curates an art auction. There is a growing list of reputable artists, supporting Seebrücke by donating an art work. Akinbode Akinbiyi, Uli Aigner, Ariel Efraim Ashbel, Norbert Bisky, Ally Bisshop, Lysann Buschbeck, Johannes Buss (Radical Adults Productions), Sol Calero, Jennis Li Chengtien, Isaac Chongwai, Elly Clarke, Black Cracker, Cucula, Lucinda Dayhew, Viviana Druga, Antje Engelmann, FAMED, Abrie Fourie, Moritz Frei, Simon Fujiwara, Alexandra Gaul, Alexander Gehring, Surya Gied, Michel Gockel, Sebastian Gögel, Monika Grabuschnigg, Grit Hachmeister, Matthias Hamann, Paule Hammer, Satch Hoyt, Stine Marie Jacobsen, Clara Jo, Anne Duk Hee Jordan, Steffen Junghans, Aneta Kajzer, Tobias Kaspar, Fabian Knecht, Cyrill Lachauer, Matt Lambert, Lorenz Lindner, Hanne Lippard, Lemia Monet Bodden, Rachel Monosov, Marco Montiel Soto, Raphael Nagel, Heide Nord, Emeka Ogboh, Ahmet Ögüt, Murat Önen, Funda Özgynaydin, Alona Rodeh, Tere Recarens, Matthias Reinmuth, Johannes Rochhausen, Egill Saebjörnsson, Michael Sailstorfer, Sophia Schama, Ralf Schmerberg, Tilo Schulz, Maya Schweizer, Slavs and Tatars, Katja Stoye-Cetin, Anna Szilit, Anna Run Tryggvadottir, Markus Uhr, Viron Erol Vert, VIP, Shira Wachsmann, Raul Walch, Clemens von Wedemeyer, Euan Williams, Susanne M. Winterling, Tobias Zielony and others.